We’d love your help. 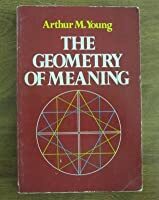 Let us know what’s wrong with this preview of Geometry of Meaning by Arthur M. Young. To ask other readers questions about Geometry of Meaning, please sign up. Unfortunately overlooked work. Its ideas are not likely to displace current pop science paradigms, but the attentive reader's efforts will be rewarded with a deft and elegant metaphysical examination of a geometric-based study of meaning. Physical phenomena (force, work, velocity, etc.) and their respective relationships with one another form a central part of the analysis in which sequence, order, and harmonics are explored. It is not overly dense, and while it contains some specialized language Unfortunately overlooked work. Its ideas are not likely to displace current pop science paradigms, but the attentive reader's efforts will be rewarded with a deft and elegant metaphysical examination of a geometric-based study of meaning. Physical phenomena (force, work, velocity, etc.) and their respective relationships with one another form a central part of the analysis in which sequence, order, and harmonics are explored. It is not overly dense, and while it contains some specialized language, this book should be easy to understand for most readers familiar with math and with cursory knowledge of the sciences. Some of the content is speculation-based, but it is an inquiry performed with such dexterity that the reader suspends criticism to see where it leads, which, by the way, is to a stunningly gorgeous and brilliant thought experiment in which the problem of free will finds a uniquely satisfactory solution. Recommended to all self-styled scholars and students of truth. Read this book if you want to know how determinism and free agency can coexist in a model of consciousness, if you are curious what the developmental trajectories of the basic structures in physics potentially represent, if you enjoy discussions on esoteric schemas such as astrology and how they can complement Western empirical descriptions of patterns within systems, and if you enjoy metaphorical as well as literal interpretations for things both abstract and concrete. Arthur Young was the developer of the Bell Helicopter. A brilliant scientist, her lends his hand to the structure and behavior of consciousness. "Are You Done Reading "The Reflexive Universe" : https://www.goodreads.com/review/show... "!"